These mini puffs — crispy pastry shells (pâte à choux) filled with creamy filling and topped with chocolate sauce or caramel — are an easy, elegant dessert. Or turn them into tiny profiteroles: stuff puffs with a scoop of ice cream, drizzle with fudge sauce or caramel sauce, and serve two or three to a plate, for a gorgeous dessert. Combine the water, butter, and salt in a medium-sized saucepan. Heat until the butter has melted, and bring to a rolling boil. Remove from the heat and add the flour all at once, stirring vigorously until the mixture smooths out and comes together into a ball; this should take less than 30 seconds. If needed, return the pan to the heat for a few minutes to help the batter come together. Remove the pan from the heat, and transfer the dough to the bowl of a stand mixer. After 7 minutes, check the temperature of the dough: you should be able to hold a finger in it for a few seconds. If you have a digital thermometer, the temperature should be below 125°F. Beat in the eggs one at a time; the mixture will look curdled at first, but when you add the last egg it should become smooth. Beat for 1 minute after adding the last egg. You'll have a stiff, smooth batter. Transfer the batter to a pastry bag with a 1/2" diameter round tip. Pipe into mounds about 1" in diameter (the puffs will double in volume as they bake), leaving 2" of space between them. Alternately, if you don't have a pastry bag, drop the batter by teaspoonfuls onto the prepared sheets (a teaspoon cookie scoop works well here). Bake the puffs for 15 minutes, then reduce the oven temperature to 350°F and bake for 20 to 25 minutes more, until they're a medium golden brown. Don't open the oven door while the puffs are baking. Remove the puffs from the oven, and use a sharp knife to cut a slit into the side of each for steam to escape. Return to the oven for 5 minutes, then remove from the oven and transfer to a rack to cool. To make the filling: Combine the pudding mix, milk, and vanilla, whisking or beating until the mixture starts to thicken. Refrigerate until set. When they're cool enough to handle, split the puffs in half to make tops and bottoms; doing this will expose the center to air and keep them from becoming soggy. To assemble: Fill each of the puff bottoms with a heaping tablespoon of pudding. Replace the top. It's best to do this within an hour of when you'll be serving the puffs, otherwise they get soggy. Sift some confectioners' sugar atop the puffs just before serving. For profiteroles, scoop a generous tablespoon of ice cream onto the bottoms of the puffs; replace the tops. Drizzle with sauce before serving. 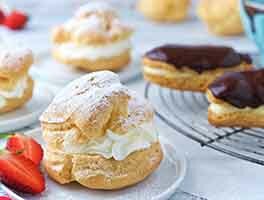 To make cream puffs, simply whip 2 cups of heavy cream with a teaspoon of vanilla extract and 2 to 3 tablespoons confectioners' sugar. For more flavor, place a few fresh berries in the pastry shell before topping with stiff whipped cream. Replace the shell's top, and sprinkle with a dusting of confectioners' sugar before serving. To freeze unbaked puffs, drop them close together onto one greased (or parchment-lined) baking sheet, cover gently with greased plastic wrap, and freeze. When frozen, transfer to a plastic bag and seal tightly. Use within one month. To bake puffs that have been frozen first, place the frozen puffs (no need to thaw) on the prepared baking sheet, leaving 1 1/2" to 2" between them. Bake for 30 minutes, or until they're a medium golden brown. My daughter, who is 11, made this recipe all by herself. They came out wonderfully and so pretty! The directions were easy to understand and produced a very pretty product. 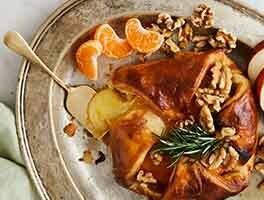 Would this recipe work with white whole wheat flour? I'm trying to do more baking with it, but not sure if there are some things I shouldn't use it for. I have always been afraid of choux dough for some reason. Finally, I bit the bullet and made these. They are soooo easy. 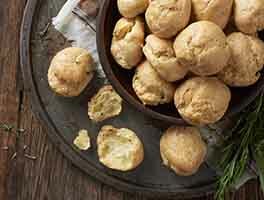 Next time I think I'll make gougeres! After binge watching The Great British Baking Show, I decided I needed to try my hand at choux paste. 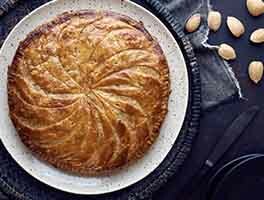 I was only looking for the pastry half of the recipe, so I can't vouch for the filling but the puff itself is easy. I used my new Thermopen to figure out when it was time to add the eggs (below 125 F.) I mixed the eggs in by hand. An electric mixer might have done a better job, but it's not essential to the success of the recipe if you don't have one or don't want to dirty it. It's fun to watch the puffs rise in the oven. These mini puffs are very easy to prep and bake. I halved the recipe and served with chocolate mousse. Delicious! This is the FIRST thing I learned to cook as a child, even before choc chip cookies or brownies. 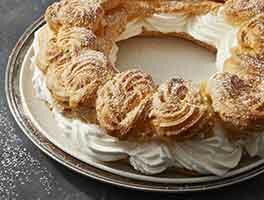 So many peeps think it's hard to make pate au choux, so thank you for not only posting a recipe but all the pics. If you've been afraid to try these, please don't be----so fun to make and yummy to eat.